We’d love your help. 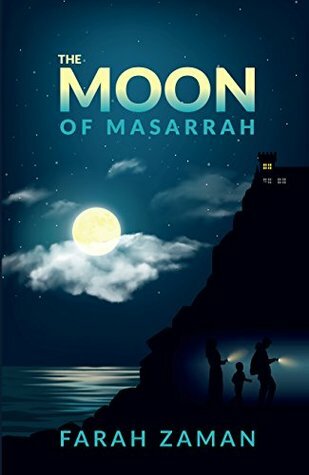 Let us know what’s wrong with this preview of The Moon of Masarrah by Farah Zaman. Would you help to look for a famous diamond if you knew it might cost you your life? Zaid had no idea of the danger involved when he and his sister Zahra, join with new friends Layla and Adam in a quest to find the missing Moon of Masarrah diamond. Their idyllic summer vacation takes many surprising twists and turns as they rummage around Bayan House for the elusive gem. D Would you help to look for a famous diamond if you knew it might cost you your life? Zaid had no idea of the danger involved when he and his sister Zahra, join with new friends Layla and Adam in a quest to find the missing Moon of Masarrah diamond. Their idyllic summer vacation takes many surprising twists and turns as they rummage around Bayan House for the elusive gem. Discovery of a dusty journal compels them to investigate an old murder, and mysterious boats in Bayan Cove throw them into the path of dastardly pirates. The teenagers are tested to the limits of endurance as they face one setback after another. Will they succeed in solving the riddle that will lead them to the long-lost diamond? Or will they be scared off by dangerous enemies determined to stop them at all costs? To ask other readers questions about The Moon of Masarrah, please sign up. A group of teenagers and their younger brothers visit the grandfather of one group and old friend of the other group. After learning of a list treasure they embark on a treasure hunt. I recommend this book to young people who like adventure and mystery. I received this book from Goodreads for free. A group of teenagers after learning of a list of treasure they embark on a treasure hunt. This book has a lot of adventure and mystery and keeps you wanting to find out what happens next. I would recommend this book to young people and adults who like mystery and adventure. My first time reading from this author and I really enjoyed. Thank you. My grandson will love this book about five kids trying to solve a mystery. I really enjoyed the book and hope for more adventures to come! Great adventure book! As a young girl, Farah spent many hours with her head buried in books of mystery, intrigue and adventure. The inevitable outcome was picking up pen and paper to create her own stories. Farah's love of reading coupled with her love of writing gave her the impetus to complete her first novel. She presently lives in New York with her family.